I finally caught up with GET OUT, writer-director Jordan Peele’s racial satire. A box-office smash beloved by critics (well, most of them), Peele takes Ta-Nehisi Coates’s “black bodies” rhetoric and recasts it into a horror-thriller. 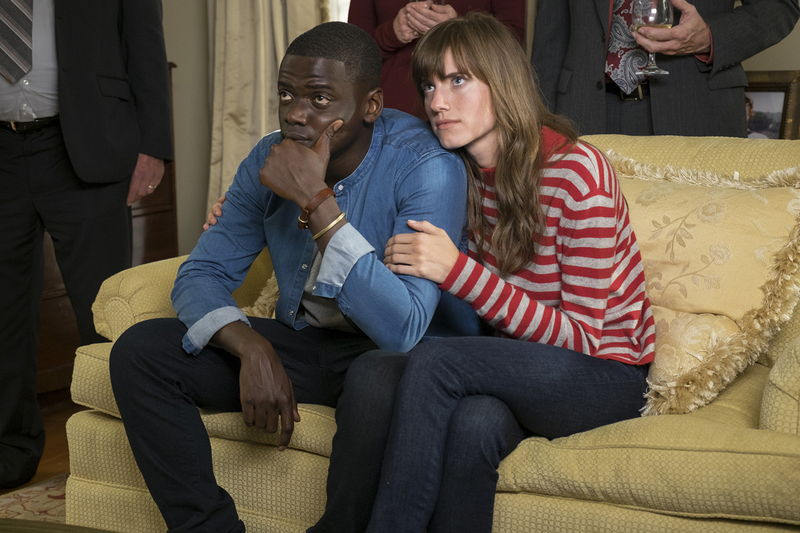 Chris Washington, a young black man played by Daniel Kaluuya, is going away for a weekend with his white girlfriend, played by Allison Williams, to meet her parents for the first time. While there, Chris discovers that he’s the target of an ongoing plot whereby a cadre of rich white people kidnap blacks to use their bodies as either neutered slaves or host vessels for their transplanted brains. It’s a juicy premise that may work as social commentary, but fails as a thriller. By coincidence my co-blogger Enzo watched it the same night I did and we got to talking about the screenplay. As he pointed out, thrillers like this — from SHADOW OF A DOUBT to ROSEMARY’S BABY, to B-grade fare like UNLAWFUL ENTRY or even C-grade fare like THE FIRM — rely on exploiting the protagonist’s trust. The protagonist should want to be a part of the world that will double-cross him. This raises the emotional stakes and makes the betrayal greater. But here, Chris is skeptical of the white world from the beginning. Instead of being reluctant to go on the trip, he should be the eager one. Instead of reluctantly submitting to the hypnosis that is ultimately used to control him, he should have volunteered. Even worse, the movie gives Chris every reason to be repulsed by the whites. All of them look, act, and talk like creeps, when they should be ingratiating and charming. Peele says in his commentary that the movie was written during the Obama era when people were celebrating a “post-racial America,” but Peele thought that was a lie, that racism was simmering right beneath the surface. He intended the movie to be a “gut punch” (his phrase) as to how things really are. But for a gut punch to be really effective, the protagonist should be caught off guard, yet Chris is on guard nearly the whole time. Although shot in Alabama, Peele is skewering the racism of middle-and-upper-class white liberals who oppress blacks not out of a sense of superiority, but because they feel inferior. The whites want what they perceive to be superior black strength, coolness, and sexual prowess. Given their perverse love, it would make more sense for them to approach Chris with seduction, instead of obviously alienating him and us. Closely related to the first part, the movie should bring us into his head as he realizes that their seduction masks an ulterior motive. During the party scene, Enzo suggested a dialogue soundtrack with half-heard words, overlapping dialogue, and more ambiguity. Instead, none of the white people make any attempt to hide their true selves. They all say the exact wrong thing. “Peele should be turning the screw, but instead he keeps hammering the same nail,” Enzo said. Another major mistake is the opening tag, a pre-title sequence where the movie announces its intention too baldly. In the scene, a black man played by LaKeith Stanfield finds himself lost in an upscale suburban neighborhood. (It’s funny how the streets are lined with the kind of old-fashioned lampposts that serve as romantic beacons in LA LA LAND. Here, they’re transformed into markers of white supremacy.) A car follows him and when Stanfield tries to flee, he’s abducted, and turns up later in the movie as the lobotomized stud for a white woman twice his age. Peele is attempting Hitchcock’s classic “show the bomb under the table” in an attempt to heighten the suspense. But because he fails to dramatize the story, because we’re kept at a distance from Chris the way he keeps the white world at a distance, the suspense is diminished, not heightened. The suspense is also deflated when Peele cuts to Chris’s best friend, played by Lil Rey Howery, as he investigates Chris’s disappearance. What’s meant to be a bit of comic relief instead throws off the pacing of a crucial sequence. On the other hand, the fact that a competent, dedicated TSA agent turns out to be Chris’s knight in shining armor is perhaps the movie’s most generous joke. This entry was posted in Movies and tagged Allison Williams, antiracism, Daniel Kaluuya, horror, Jordan Peele, LaKeith Stanfield, Lil Rey Howery, racism, Ta-Nehisi Coates, thriller. Bookmark the permalink.